You can display the velocity model curve in the Vp track in Synthetics. As a prerequisite for this feature, you need to load a velocity volume and select the velocity volume to be used for time/depth conversion as described in Converting Time-Depth. In Synthetics, the velocity model curve is displayed as the interval velocity along the well bore. In the Control Panel, go to the View menu and open Synthetics. In the Vp track, the yellow curve is the velocity model curve extracted from the velocity volume you have defined for time-depth conversion. The curve is created along the well path by converting depth to time and calculating the interval velocities. By default, the velocity model curve is activated for display in the Vp track. To hide the curve, go to the View tab in Synthetics and click the green circle at Vel Model under the Curves section. The green circle will turn amber, indicating that the velocity model curve is hidden. 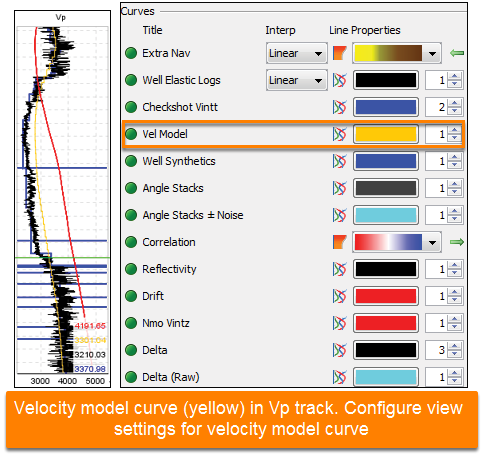 You can change the colour and thickness of the velocity model curve at Vel Model in the View tab. Click the colour box to change the colour and type the thickness value for the velocity curve.